The Jamaica Defence Force is set to launch the Caribbean Military Academy (CMA), a first of its kind institution in the English speaking Caribbean, that will transform the way in which the military serves and trains soldiers. The announcement was made by Chief of Defence Staff, Major General Rocky Meade, during a Security Symposium hosted at Up Park Camp last Friday, September 28. 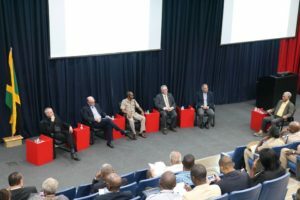 The symposium, entitled ‘Great Power, Global Competition: Opportunity or Threat’, featured presentations from Professor Laurence McCabe from the United States Naval War College and University of the West Indies (UWI) Professor Anthony Clayton. The mission of the Caribbean Military Academy is to provide accredited and quality professional military education to identified military, law enforcement and selected civilian personnel, particularly from developing and otherwise emerging states around the globe. The CMA is the first of its kind in the English-speaking Caribbean and is in line with similar establishments in other militaries across the world that have received academic accreditations for their professional military education institutions. General Meade added that “the Caribbean Military Academy will allow the JDF and other regional forces to train our own soldiers and officers at all levels, utilising international curriculums, which are tailored to meet our own specific needs in the region and the needs of militaries from other developing countries”. He also informed attendees that the CMA will cover all aspects of training, from artisan to degree. “We are going to seek, through adjunct professors, to have our senior officers do research, and they [will be] accredited with degrees in the long run,” he said. Meanwhile, Major General Meade said the JDF is embarking on a number of partnerships, citing engagement with the University Council of Jamaica, which has provided the force with a self-study guide, while discussions are advanced with the UWI on the delivery of training over the next five to 10 years. The Caribbean Military Academy will be located at the JDF Headquarters base in Up Park Camp.